Dales Jam was formed in 2003 by a group of people of all ages and musical abilities, who wanted a time and a place to meet up and play music. Since then, under the guidance of a professional music director (Richard Ormrod) the band has grown in numbers and meets at Ermysteds School in Skipton. 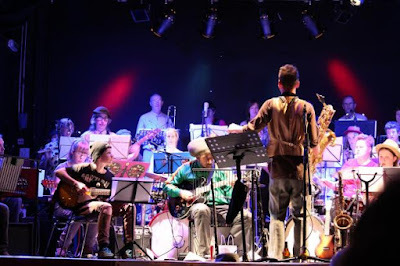 Dales Jam are a community Jazz Band based in Skipton and rehearse on a Monday night between 7 and 9.30 pm, as many as 35 people gather for a weekly workshop to learn and have fun. BlueJam Arts is based in Cumbria and run by a team headed up by Jilly Jarman. Their goal is to promote the creation, performance and sharing of new music and new ways of making music in an accessible, multi media environment. Their jazz provision includes Jazz Talk workshops led by trumpeter Geoff Bartholomew and an Improv Choir. Jazz at Heart has been running jams, workshops and gigs since early 2011. Their weekly Monday workshops were until recently run by saxophonist Matt Anderson before his move to London. Now, two musicians have taken the helm - guitarist Sam Dunn and saxophonist Ben Lowman. Often the workshops have a composer/stylistic theme per term and there is also an annual summer jazz course run by Matt Roberts. Sheffield Jazz has been running music education events for 35 years and there is a loyal following of young musicians and adult learners at their weekly Saturday workshops. The numbers for these workshops have grown in size over the years and now there are streamed classes for different abilities. Tutors include Pete Lyons, Seth Bennett, Hannah Taylor, Chris Walker and Nick Fletcher.